The gang this week was Terry, Jon Mark, Bill, Tommy, Timmy (new to us and Tommy's brother) and myself. I'd given the crew the choice of either playing Blood Bowl or continuing our Dungeons and Dragons Fantasy Board Game campaign. The group's size (six) actually dictated the evening's festivities. 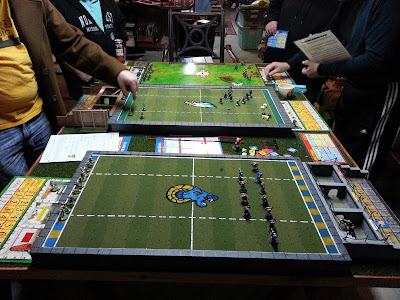 It had been a while since we last played Blood Bowl (BB from here on out), so we had a bit of a learning curve and leaned on Jon Mark's memory to get us going. We had three games running concurrently: Jon Mark's Chaos team (Lost Angels Rams) vs Bill's Wood Elves (Kandarian City Chieftains), Terry's Wood Elves (Fingolfin Thorons) vs Jon Mark's Orcland Raiders team (I played them) and Tommy (New Order Saints) vs Timmy (Webb Stadt Kardinäles) in an all-human scrum. 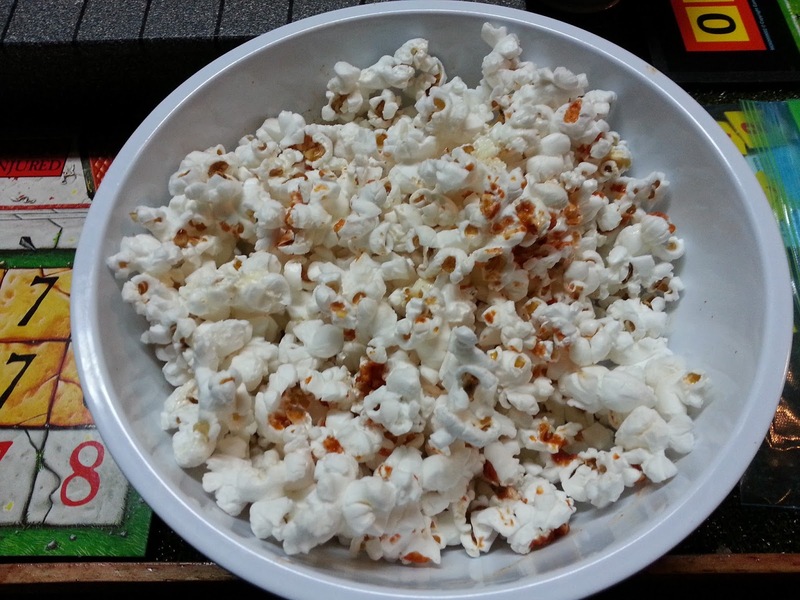 My wife graciously made Crack Corn, thus appeasing the hungry masses! All behold the Crack Corn! This blog post will be a little different, as Jon Mark has graciously written his own after-action report of his game with Bill. With so much to report, I'll break the night's festivities into two different postings. WARNING: This is picture intensive!!! 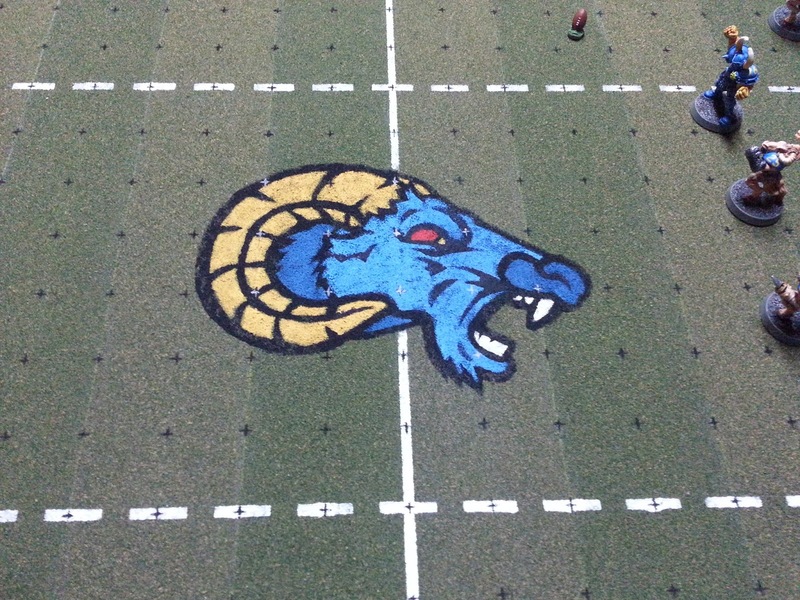 "It is a be-a-u-tiful day in Spearhead Stadium as the Kandarian City Chieftains take on the Lost Angels Rams!" - Bob Grisley. Bill received the opening kickoff and was moving the ball until he ran into a wall of Beastmen. His Wardancer got hit and fumbled the ball while attempting a dodge. The Rams, who were more intent on doing as much damage to the Elves as physically possible, realized that the ball was loose and they could actually score for once. 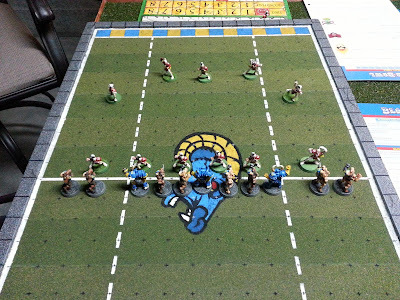 Faulkenhoof, one of the Beastmen, picked up the ball and started moving his hooves as fast as possible, picked up some blockers and headed to the end zone. It was a frightening sight to behold as the minions of Chaos rolled through the Elves! It has to be said that the Chieftains put up a valiant effort to try to stop the Rams from scoring, but momentum (and die rolls) were against them on this drive. Score - Rams 1-Chieftains 0 with 3 turns left in the half. The ensuing kick was short and the Chieftains found themselves in great field position. A well ran route (clutch dodge rolls) by the Elven catcher had him well behind the Rams defense, who again, couldn't care less about where the ball was. The catcher made his break and overran the spot where his thrower was aiming. A fantastic pass was launched and the ball landed 2 squares behind the receiver. The Chieftains have one more turn to get the ball and score. 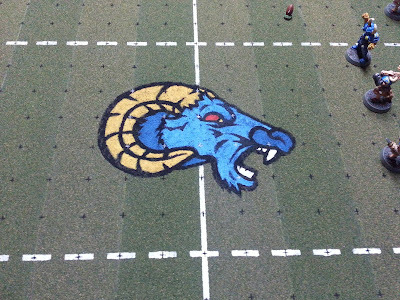 This is where things got brutal as the Rams started inflicting heavy damage! The beatings seemed to gone on and on, several Elves had to be carted off the field and taken to the infirmary. On their last turn, the Elven catcher picked up the ball and sprinted toward the end zone only to run out of movement one square from pay dirt! The second half started with the Rams receiving the ball and the Chieftains barely able to field a team. 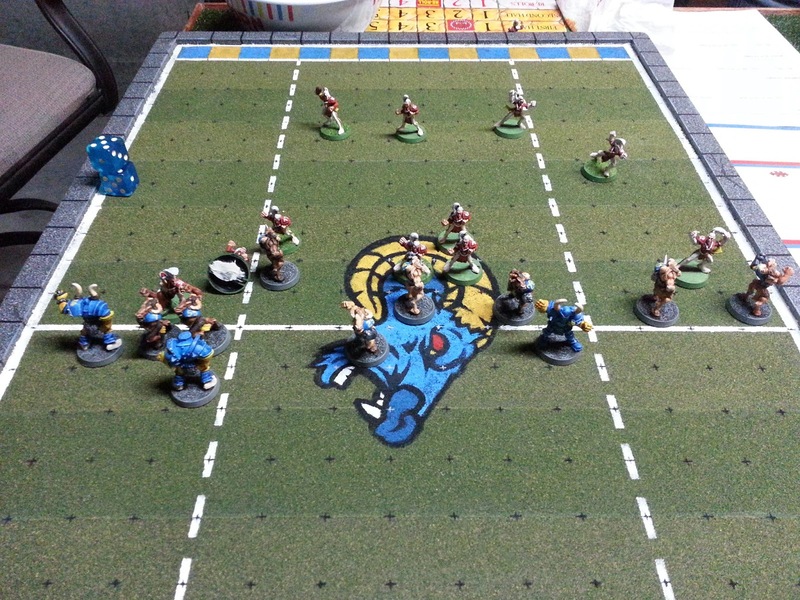 The Rams moved the ball down the pitch and scored, but not before losing a Chaos Warrior. Those pointy-eared devils are tough and fast! Score - Rams 2-Chieftains 0. Nasty scrum! Bye bye Chaos Warrior! At this point things got exciting! The ball landed in the Chieftains end zone on the kickoff. Coach Bill masterfully positioned the remaining players in a run and gun formation. With little time left, he had to pick up the ball, move his thrower into position and pray that his healthy Wardancer could get free. Momentum shined on the Elves as the play evolved, but time was dangerously close to running out. The Wardancer leaped and twisted through hoards of the enemy and the thrower lined up for a last second long bomb pass. All the odds were against Coach Bill (he needed to roll a 5 or 6 on every skill check), but nobody told him that! The thrower heaved the ball in a perfect spiral and hit the receiver right in the hands. Alas, the Elves could not capitalize as they ran out of movement. Final Score: Rams 2 - Chieftains 0. Thank you, Jon Mark, for that scintillating account! Stay tuned for highlights from Game 2!